Recognizes a protein of 116kDa, identified as P-Cadherin-1 (CDH3). It is a calcium-dependent cell-cell adhesion glycoprotein comprised of five extracellular cadherin repeats, a transmembrane region and a highly conserved cytoplasmic tail. This gene is located in a six-cadherin cluster in a region on the long arm of chromosome 16 that is involved in loss of heterozygosity events in breast and prostate cancer. 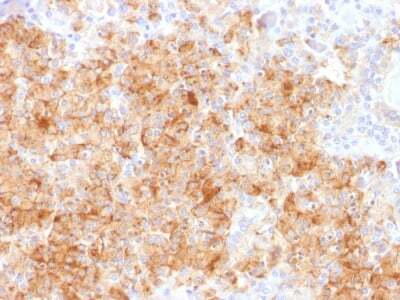 In addition, aberrant expression of this protein is observed in cervical adenocarcinomas. Mutations in this gene have been associated with congenital hypotrichosis with juvenile macular dystrophy. Small volumes of anti-CDH3 antibody vial(s) may occasionally become entrapped in the seal of the product vial during shipment and storage. If necessary, briefly centrifuge the vial on a tabletop centrifuge to dislodge any liquid in the container`s cap. Certain products may require to ship with dry ice and additional dry ice fee may apply. Formalin-fixed, paraffin-embedded human Parathyroid stained with Chromogranin A Rabbit Recombinant Monoclonal Ab (CHGA/1731R). NCBI/Uniprot data below describe general gene information for CDH3. It may not necessarily be applicable to this product. Sanders DS, Perry I, Hardy R, Jankowski J. Aberrant P-cadherin expression is a feature of clonal expansion in the gastrointestinal tract associated with repair and neoplasia. J Pathol. 2000 Apr; 190(5):526-30.